Tom Greaves of DotProduct grabbed his chance to scan the famous and historic Alamo façade in San Antonio, Texas, while the site was quiet. Without the use of any tripods, scaffolding, drones or lasers, Tom simply walked along the public path with a hand-held scanner and within 10 minutes had gathered a full 3D scan data of the building in the form of a full color point cloud. 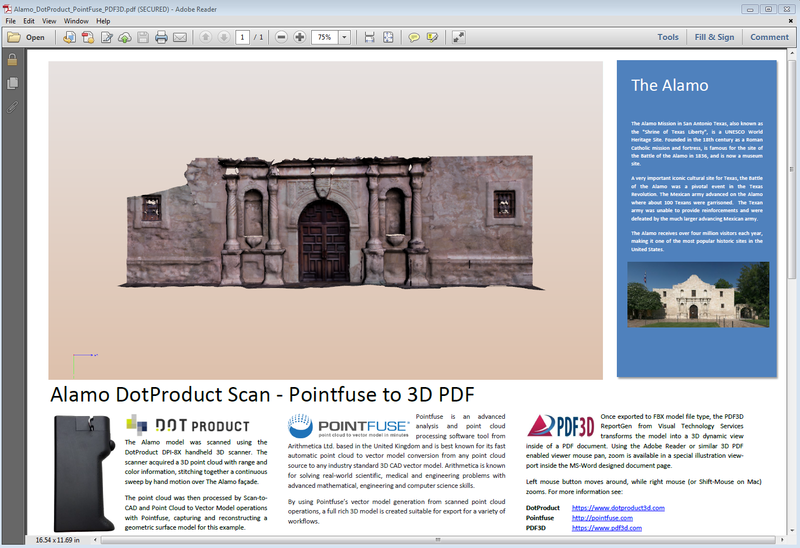 The Alamo model was scanned using the DotProduct DPI-8X handheld 3D scanner, which acquired a 3D point cloud with range and color information, stitching together a continuous sweep by hand motion over The Alamo façade. The point cloud was then processed by Scan-to-CAD and Point Cloud to Vector Model operations with Pointfuse, capturing and reconstructing a geometric surface model for this example. Pointfuse is an advanced analysis and point cloud processing software tool from Arithmetica Ltd. based in the United Kingdom and is best known for its fast, automatic point cloud to vector model conversion from any point cloud source to any industry-standard 3D CAD vector model. Arithmetica is known for solving real-world scientific, medical and engineering problems with advanced mathematical, engineering and computer science skills. By using Pointfuse’s vector model generation from scanned point cloud operations, Tom was able to create a full rich 3D model for export, however, for Tom to easily share this image with others in an efficient workflow, he needed to convert the file into a commonly used format like PDF. Tom exported the model to FBX model file type and then used the 3D PDF conversion tool, PDF3D ReportGen, to transform the model into a 3D dynamic view, which could be embedded inside a PDF document in just one click. This then allowed Tom, and any recipient he chose, to fully explore the Alamo image using the free Adobe Reader. The 3D PDF report generated by ReportGen is automatically enabled with viewer mouse pan and zoom via a special illustration view-port inside the MS-Word designed document page: left mouse button moves around, while right mouse (or Shift-Mouse on Mac) zooms. This is a wonderful example of how 3D PDF can streamline sharing, and enhance the viewing or presenting experience. Please visit our other blogs to discover more about the benefits of 3D PDF.